In days long past, when we wanted to record audio, we’d take a mic, connect it to an audio mixer, then push the Record button on a tape deck. Everything worked great; well, if you ignored tape hiss, errant magnets, and tape suddenly crumpling around the capstan. As if that wasn’t enough, computers suddenly took over the audio industry with nary an XLR connector to be seen anywhere. Now what? For a while, we would connect an analog microphone to our computer using an A/D converter from companies like FocusRite, Edirol, Steinberg, PreSonus and others. The good news was that these allowed us to use our existing mics with new computer gear. NOTE: An A/D converter converts the analog voltages generated by a mic into the binary ones and zeros required by a computer. But, this additional piece of gear often meant that the quality of your mic was actually determined by the quality of your A/D converter. A much better solution is to have the A/D converter built-into the mic itself. However, while this simplified connecting a mic to a computer, many initial efforts could not match the quality of a microphone recorded in analog mode. 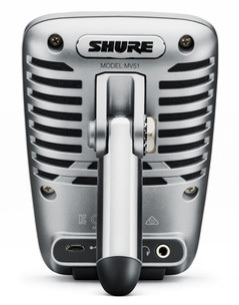 Recently, Shure took this quality issue as a challenge and created the Motiv series of microphones. 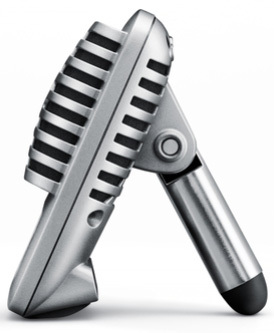 Earlier, I reviewed the MV88, a small mic designed for iOS devices. In this article, I want to look at its bigger brother, the MV51. 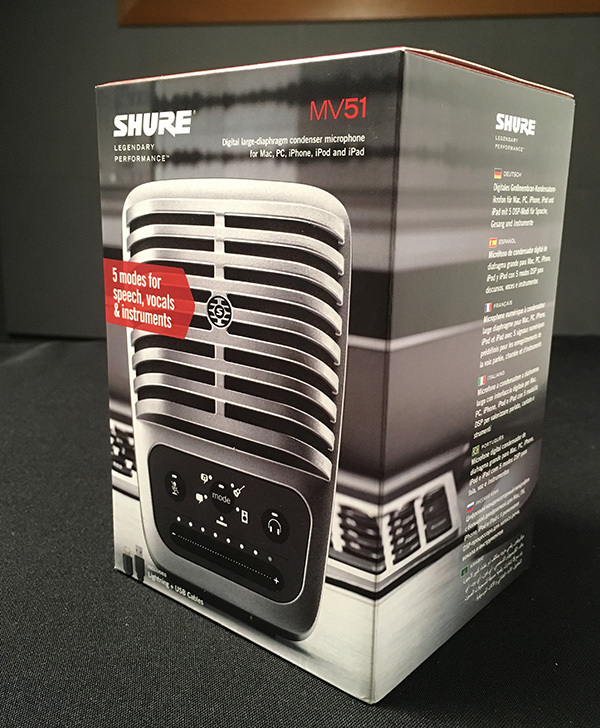 The Shure MV51 is a large diaphragm condenser mic, with both an integrated kickstand for tabletop use and a microphone stand adapter for traditional mounting via a mic stand. It plugs directly into a computer via USB 2, or an iOS device using an included Lightning connector. Designed for home studio recording, or the audio side of video conferencing, it is compatible with iOS, Android, Mac and PC devices. Connecting this mic to a Mac or iOS does not require installing any additional drivers or software in order to use the mic. It includes an integrated stand, USB and Lightning cables, and user guide. NOTE: This image makes the mic look ENORMOUS. In point of fact, its about 4.5 inches high and about 3 inches wide. It fits very nicely on any size desk. The mic is powered through the USB/Lightning connector. No batteries needed. The MV51 ships in a small cardboard box. When unboxed, all packaging material is recyclable and includes a user guide and two necessary cables; one USB and the other Lightning. The MV51 is dead easy to use. 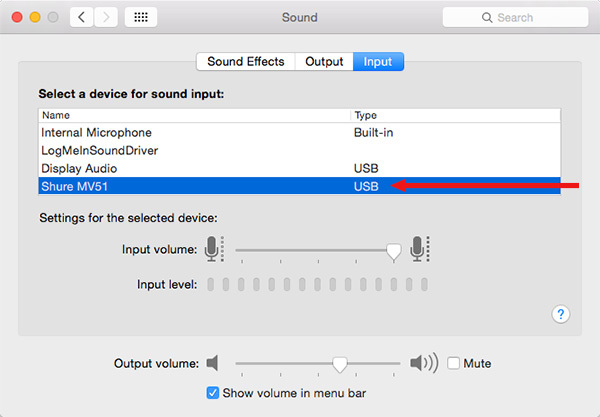 Plug it in, then, on a Mac, go to System Preferences > Audio and select the mic in the Input section. 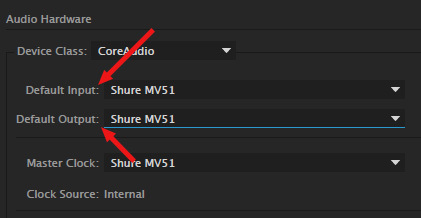 If you plan to plug headsets into the mic, you’ll need to set the Output to the MV51, as well. Some audio software – such as Adobe Audition – allows selecting which audio source we want to use. So, here in Audio Hardware preferences, I selected the MV51 for both input and output. 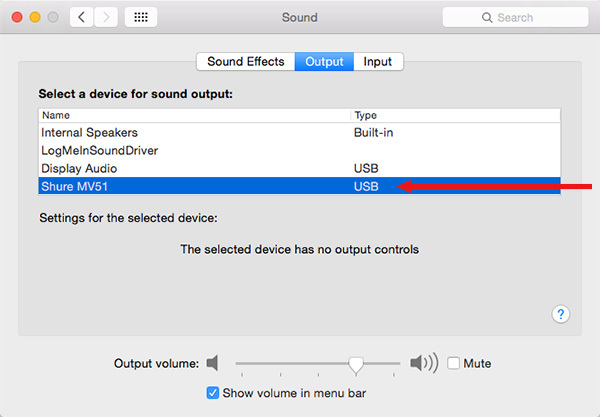 Not all audio software requires this step, most simply use the choice you configured in System Preferences. As part of this review, I recorded a short audio narration using three desk mics and a Shure hand-held mic (SM-58). You can listen to these mics here. (This is a single, uncompressed WAV file about 2 minutes in length). With any mic, the closer you are to the mic, within reason, the warmer and cleaner it will sound. These recordings were all done with the mic about 4 inches away from my face. Depending upon the acoustics of your studio, the farther away the mic gets, the more room noise, echoes and “hollowness” it will pick up. NOTE: The only changes I made to these audio files was editing them together and adjusting levels. No compression or EQ was used in these recordings, the MV51 was recorded using the Flat setting. Shure has a deservedly legendary reputation for ruggedness. 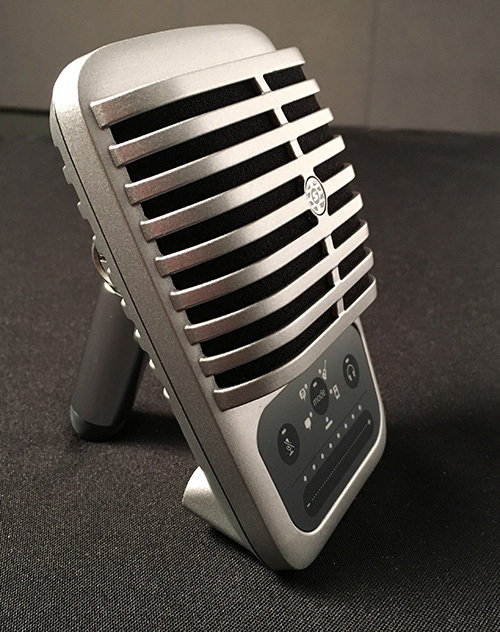 This mic lives up to that reputation: built from a solid metal enclosure, it is designed to survive traveling-rock-band abuse. Or, forgotten in the bottom of a college student’s back-pack until the session starts. Either way, this unit has “survival” written all over it. This is one of the reasons I own so many Shure mics – they work and last forever. The mic connection uses a mini-USB connector. If you lose one of the supplied cables, a replacement cable can be found just about anywhere. Connection and configuration is dead easy, the user manual is helpful. This is not a complex piece of equipment to use. The mic stand screw is hidden by the small rubber foot. Unscrew that, and you can attach the mic to any mic stand. The mic has five DSP settings, allowing you to quickly optimize the mic for speech, singing, acoustic instrument, loud music, and flat). Record using all five of these and pick the one you like the best. These settings affect gain, EQ, compression and limiting, where Flat turns all of these off. The only thing I noticed that concerns me a bit is that when speaking, I needed to turn the gain up to one-dot below maximum to get acceptable (-8 dB) levels in Flat mode. This is a lot. On the other hand, using the Speech DSP setting would apply compression to achieve necessary levels. 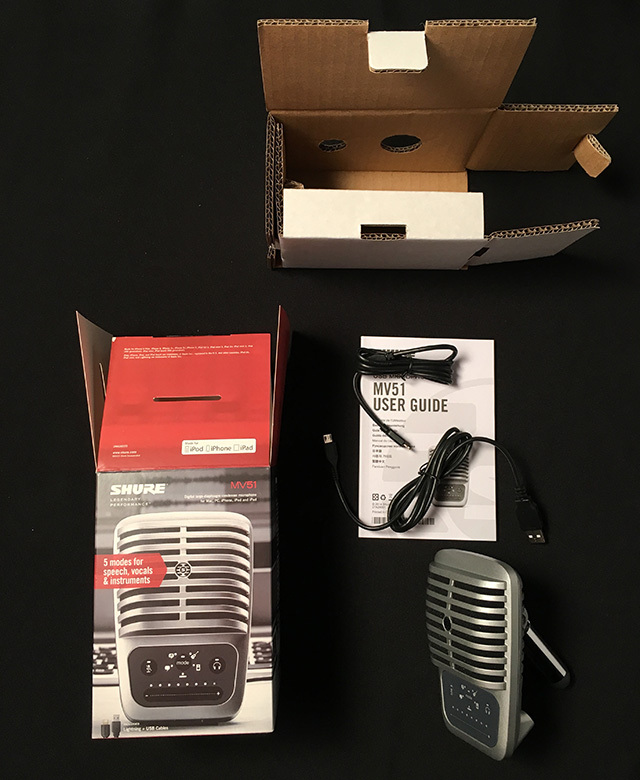 Recently, as I was preparing this review, I had an email conversation with Soren Pedersen, Product Manager for the Motiv line of mics at Shure. Larry: (Big smile…) My first question was GOING to be, why doesn’t this mic screw onto a mic stand… UNTIL I went to the website and discovered the little rubber foot jobby unscrews. Sigh… A little research is a good thing! Soren: Glad you found it! Larry: The mic supports both USB and Lightning connectors. Is there a quality difference between them? Soren: The mic sounds exactly the same on both formats, no quality difference. Larry: Do the presets change pickup pattern, or just EQ/Compression/Limiting? Soren: The MV51 is a cardioid microphone and the presets do not change this, just the Eq/compression/limiting as you mentioned. There’s also a de-esser in the vocal modes. Larry: If you were recording into an audio application, such as Adobe Audition or ProTools, is the best option to use the Flat preset? Soren: The best option is the one that sounds best to you. We included the flat mode for those users that prefer to use their own processing, but we’ve taken great care to tune the DSP presets to sound great. The DSP modes let you get setup and sounding great really quickly without having to worry about processing yourself. Larry: I am REALLY impressed with the rugged housing. While all mics are delicate, would this compare to an SM-57 or SM-58 in terms of its ability to handle abuse? Soren: Like all Shure mics, the Mv51 has to pass our extremely rigorous product testing including our infamous drop test. We’ve engineered the MV51 to be durable enough to be portable and mobile. It’s fine just being thrown in your bag or suitcase, and it’s really very durable. Larry: When recording in Flat mode connected via USB into Adobe Audition, I was struck by how low the mic levels were – hovering around – 30 dB. An SM-58, by comparison, was around – 10 dB. Is this mic, like the MV88, designed for loud music levels? Soren: Make sure the gain on the microphone is turned up all the way to get more level. Without knowing where you were placing the mic and what you had your SM58 plugged into and what gain the interface was applying it’s tough to compare directly. It has a similar ‘engine’ to the Mv88 and should do well in quiet or loud environments. LARRY’S UPDATE: After I read this, I went back, increased the gain on the mic and re-recorded the audio. Soren is correct, there was enough gain to get a good recording. Larry: When recording, the green volume dots on the front could not be adjusted. Do these affect mic level or headset level? Soren: The green dots affect mic level, the yellow dots are headset level. Unless the software you are using blocks a gain change for some reason, you should be able to swipe left or right on the bottom of the touch pad to increase mic or headphone volume. Larry: The Shure website describes the frequency response “Adjustable.” Where and to what degree? Soren: Perhaps ‘varies’ is a better word because of the EQ changes in the DSP preset modes, but also when you use the Mv51 with the Shure+ Motiv app you get access to a 5 band EQ so you can adjust it however you like. Larry: Who do you view as the target market for this mic? Soren: Musicians, podcasters, content creators. It’s a great setup for Skype and video conferencing as well. Larry: When recording in voice mode, for example, for a podcast, is this recording stereo or mono? 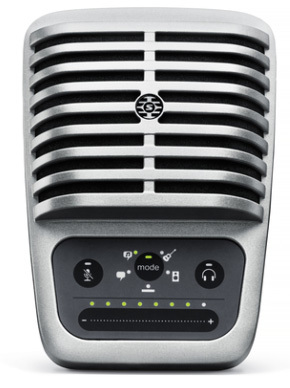 Soren: The MV51 is a mono-only microphone. Larry: What usage tips do you suggest for podcasters to make the most of this device? Soren: Besides the normal microphone best practices like try to get in a quiet environment and stay a consistent distance from the microphone, experiment with the different DSP modes to find ‘your sound’. Make sure to try all the modes even if they aren’t labeled for voice. 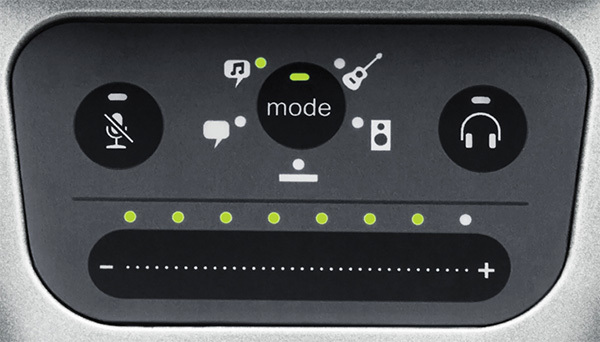 The speech mode works great for most, but we’ve had a few customers with nice deep voiceover style voices find the acoustic instrument mode as their favorite. It’s a bit of a brighter sound and balanced out the bassy sound of their voice. There’s no right answer it’s all about experimenting. Larry: Where can we go on the Shure website to get more specs on this mic? The mic page itself is pretty skimpy. Soren: From the MV51 page there’s a link to user guides and the spec sheet. Shure makes great mics. Rugged, reliable and easy to use. 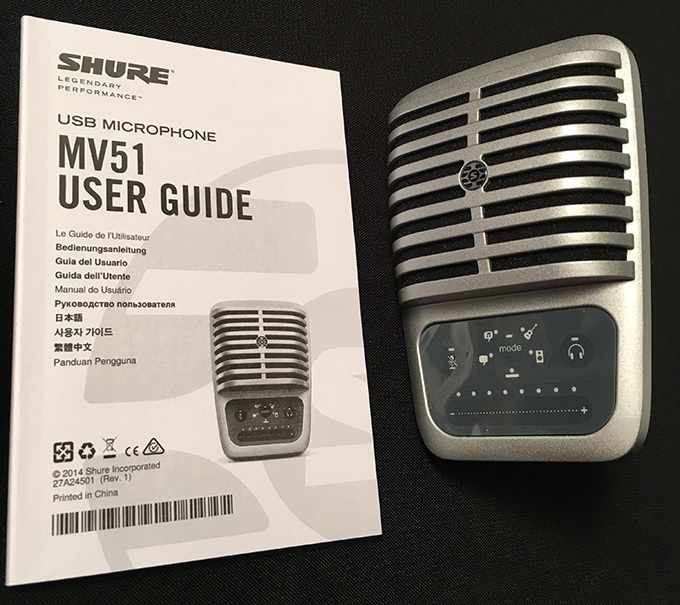 The MV51 fits in with the rest of the Shure family. It easy to connect and easy to carry. The only question is whether you like the sound. Every voice and recording situation is different, so, take a listen to the mic samples and decide for yourself. Find resources for video editing, video production, post production, film production, and digital production. © 2019 Larry Jordan & Associates, Inc. All rights reserved.